Flat 4 Golden Bay Mansions�on St.Mary’s. Located in Thoroughfare, Hugh Town,on St.Marys the flat is�right on town beach overlooking the�harbour, a short walk from Porthcressa beach and a couple of minutes from the quay, where you can take a boat trip to one or more of the beautiful off islands. 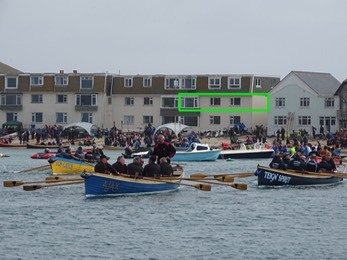 Close by is the Isles of Scilly Museum which holds a wealth of information on Scilly past and present and the Church Hall where slideshows are held every week in the summer. 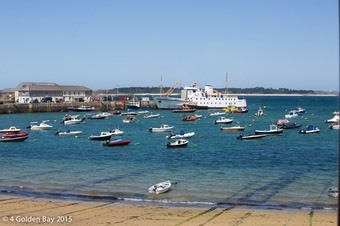 St. Mary's is the largest island of the Isles of Scilly, although it's only 2.5 by 1.75 miles! Staying on St Mary's means an enjoyable, healthy time away, whether you are interested in beaches, bronze age ruins, nature walks, bird watching, water sports, dining out, watching pilot gig racing, sunsets, shell collecting, seal watching, diving, snorkelling, picnics, playing tennis or squash, shopping, or relaxing on the beach... the list goes on and on. Once you get here you'll want to sample everything! Enjoy walking the miles of coastal paths and nature trails on this beautiful, sun lover's island. Explore the many golden beaches and coves dotted around its coastline.�Hugh Town, the capital, is situated between two wonderful sandy bays and has a wide range of cafes, pubs, restaurants and shops. There's no need to worry about hustle and bustle, the only rush hour here is when visitors walk to the quay to catch the inter-island launches around 10am. For further information or to make a booking please telephone or email us. We really look forward to hearing from you.